Washington, D.C., circa 1920. 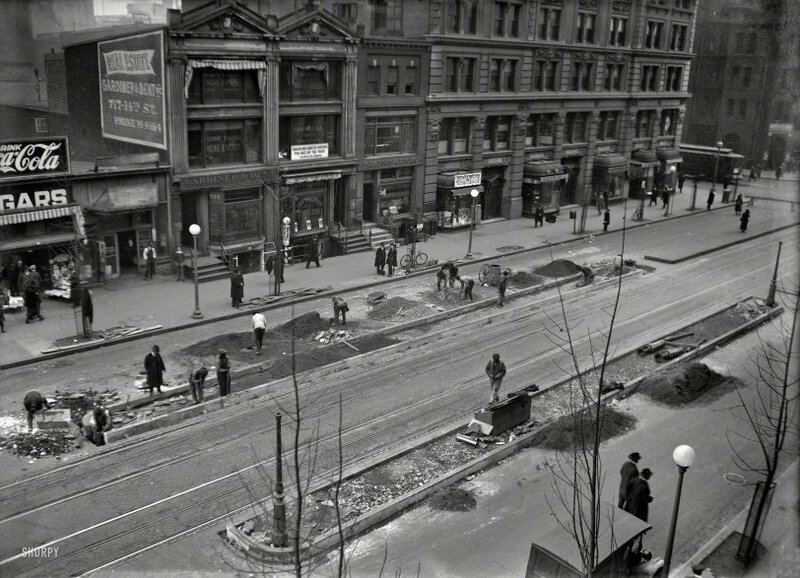 "Curb work -- car stop on 14th Street N.W." Streetcar infrastructure. Harris & Ewing glass negative. View full size. Submitted by 20002ist on Thu, 12/26/2013 - 9:51am. I suspect the "Droop" sign at top left is for Edward F. Droop & Sons, sellers of pianos and other musical instruments. Submitted by Bull City Boy on Sun, 08/11/2013 - 10:11am. Beyond the Gardner and Dent sign, we see "Droop". Surely someone can identify the business/building associated with that. Submitted by WoodsideParkBob on Sat, 08/10/2013 - 3:58pm. An unusual feature of Washington's street car system was that there were no overhead wires in the downtown area to power the cars. The streetcars were powered through "plows" that went into slots between the tracks to connect to power under the street. The slots are visible in the photo if you look closely. It was a neat system, although snow and ice could cause problems. Submitted by sash on Sat, 08/10/2013 - 1:19pm. In a few years, this scene might be repeated. If the North/South Streetcar line is built, it "would run from the Southwest Waterfront, cross the National Mall, travel up 14th Street, follow Georgia Avenue, and eventually terminate at the Takoma or Silver Spring Metro stations." Submitted by kozel on Fri, 08/09/2013 - 9:04pm. The corner building is still there. Submitted by claire9 on Fri, 08/09/2013 - 7:12pm. Shannon and Luchs Real Estate, the business located behind the parked bicycle around the center of the photo, was around until 1993, when it was bought out.